Escorts has entered into a collboration with an Italian firm BCS S.p.a. to distribute and sell the speciality Ferrari brand of tractors in India. The first product being launched under the partnership is a 26 HP model that has four equal-sized wheels, an all-time 4-wheel drive and oscillating chassis system suited for use in vineyards and orchards. Initially to be available at select dealerships in Maharashtra, the tractor, which comes at an introductory price of Rs 8 lakh, will be extended for sales across the country, Nikhil Nanda, Joint MD, Escorts said. The company today also launched a new product in the Farmtrac executive series of premium range tractors launched in April last year. 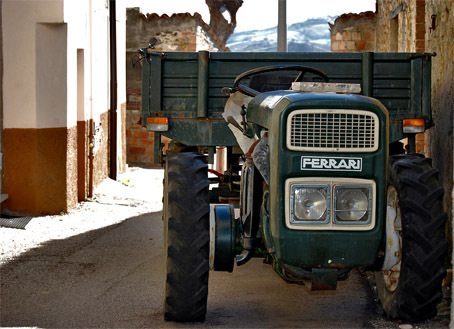 Escorts will initially import the Ferrari tractors from Italy and marketing them through its distribution channels. “As volumes grow, we will take action to make the machines cost competitive and the level of engagement will change,” Nanda said, adding that assembling them locally could also be undertaken in the future. The new 45, 50 and 60 HP tractor series with a price tag of Rs 6.5 lakh, Rs 6.9 lakh and Rs 7.4 lakh, respectively are packed with stunning looks and a car-like driving comfort, he said. The 26 HP Ferrari model, imported through the completely built unit rout from Italy, will carry an introductory sticker price of Rs 8 lakh while it sells at Rs 12 lakh in European market. “This entry-level Ferrari brand was tested for over six months from last June among 200 grape growing farmers in Nashik district in Maharashtra,” S Sridhar, chief executive officer at Escorts Agri Machinery, said. He said the new tractor will be sold under Ferrari brand brought to India by Escorts. “Ferrari brings with it new tractor technologies which India has never seen before,” Benso Marelli, managing director at BCS, said. “We are testing the India waters and as and when the volumes build up, we will join hands with Escorts to launch a factory in India,” he said. He said the Italian company, with 60 years of experience in high-quality production, world-class design and precision technologies, had a range of high-end, superior tractors up to 91 HP.